Considering the phenomenal number of articles written about Alfred Brendel, it might seem futile — or at least not particularly useful — to take yet another look at this incomparable pianist. He is an artist whose peers hold him in the highest regard. He is a perfectionist when it comes to technique, and a musical interpreter of profound sensitivity. In fact, he challenges the standards, expectations, and unspoken laws of the classical music jungle and emerges greater than ever, yet able to maintain a disconcerting frankness and modesty. Brendel has a remarkably fine-tuned “ear,” not only when performing but with regard to life in general, and he leads parallel lives that are mutually enriching. He is a chamber player (he recently joined with baritone Matthias Goerne, to the delight of fans of the vocal art); he performs with orchestra (in April he will perform all of Beethoven’s concertos with Seiji Osawa and the Boston Symphony Orchestra) and as a soloist (recitals in Montreal and Ottawa are scheduled for March and April). Brendel is also an essayist (Thoughts and Afterthoughts has been providing absorbing reading for musicians and music-lovers for over thirty years); a new-fledged poet (his collection, One Finger Too Many reveals his wild sense of humour); a collector; and a great reader, especially of works that deal with the mystery of life and eternity. His multi-faceted nature makes him one of the most well-rounded artists of his generation. It was an immense privilege and pleasure for La Scena Musicale to share a few moments with him recently. Brendel continues to be described as an “intellectual” pianist. He only entered one international competition, the Bolzano in Italy, and on that occasion he ranked fourth (a first prize was not given). His choice of repertoire has always seemed at the opposite end of the spectrum from the virtuoso fireworks of some of his colleagues. 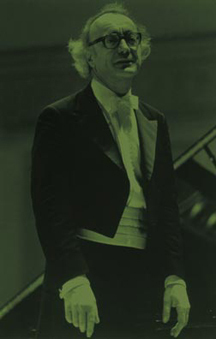 Apart from a few forays into the contemporary repertoire – Brendel was an ardent defender of Shoenberg’s Concerto almost from the beginning, for example – his choice of music has always focused on the great classical composers: Bach, Haydn, Mozart, Schubert and, of course, Beethoven (he has done several complete renditions of the thirty-two sonatas, both in concert and in recordings). He doesn’t play the Russian and French repertoire or Schumann and Brahms, yet he has always included the much-neglected Liszt in his programs. Recordings, rather than competitions or the musical star system, have served Brendel as a career springboard. Long before his American début in 1963, the public was familiar with his many recordings of Beethoven and Liszt for the Vox label. However, he takes the technological strides of the recording industry with a grain of salt. Brendel hopes to continue these horizon-widening activities for many years. “I try to be as fresh and as naive as possible every time I return to a piece. I am not prepared to be satisfied with anything, I think one should go on and try to improveÉ remaining humble while facing the masterpieces.” Such words of wisdom seem completely natural coming from this Titan of the piano, a larger-than-life personality who is always profoundly human. Going beyond time and fashion, it could have been to him that the great pianist-composer Busoni dedicated his definition of a pianist: “The pianist must have unusual intelligence and culture, feeling, temperament, imagination, poetry, and finally that personal magnetism which sometimes enables the artist to inspire four thousand people, strangers, whom chance has brought together, with one and the same feelingÉ If any of these qualities are missing the deficiency will be apparent in every phrase he plays.” In our competitive world, it is reassuring to note that, despite everything, Brendel can fulfil all his responsibilities and still touch the hearts of the faithful fans who throng to his recitals. The art of the piano lives on. Alfred Brendel will be performing on March 31 in Montreal and on April 12 in Ottawa. Win Alfred Brendel CDs: <www.scena.org>.